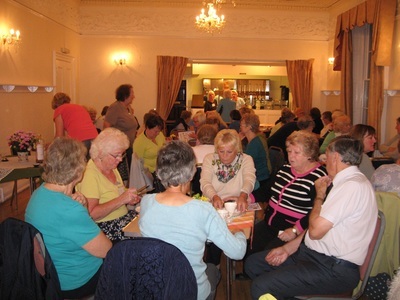 The Committee provided a sit down supper and then we had a go at the Christmas quiz. We tried to guess the identities of our fellow members as babies and toddlers and we sang carols. 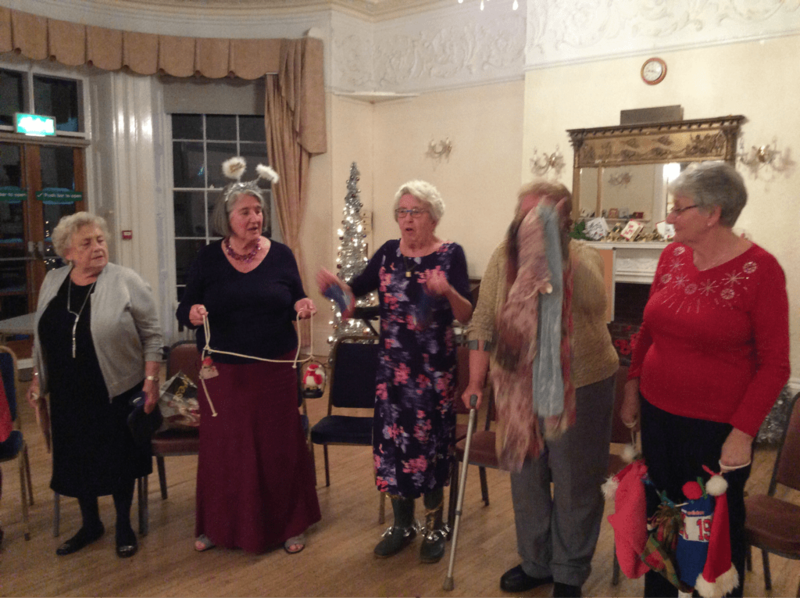 The Committee entertained us with their version of The Twelve Days of Christmas. 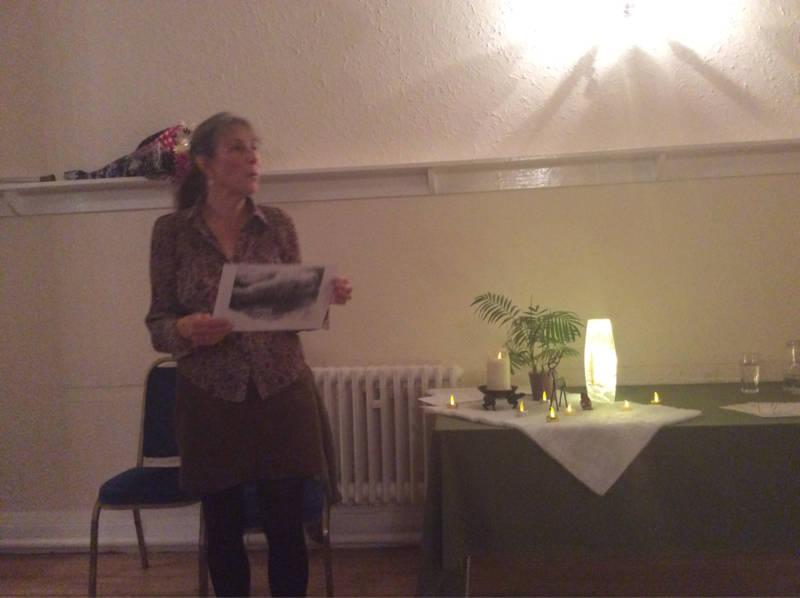 Lindsey from Radcliffe Library gave a delightful entertainment of poetry and prose with a Christmas theme, stepping in at the last minute for a speaker who let us down. I am sure no one could have held our attention any better. LIndsey took us back to Christmasses in simpler times reminding us of our own youthful happy times. 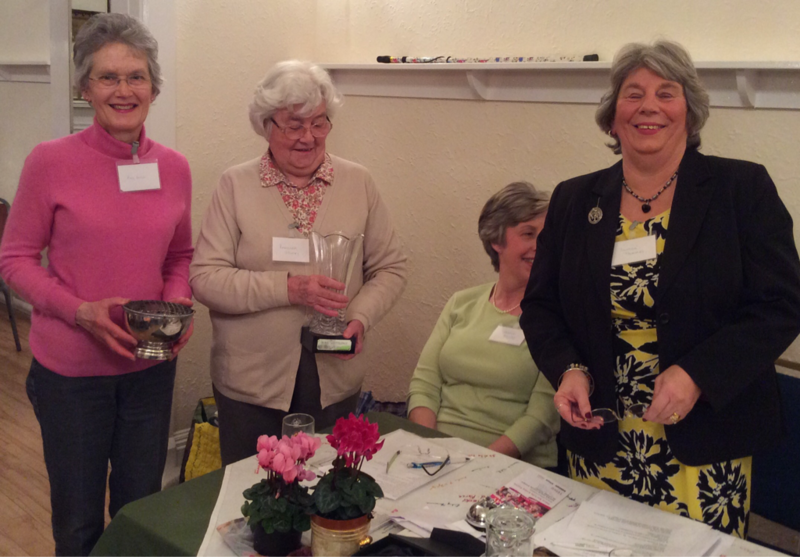 Radcliffe on Trent WI did us proud at apple day and won the Group prize for a Supper for The Speaker among other individual prizes. 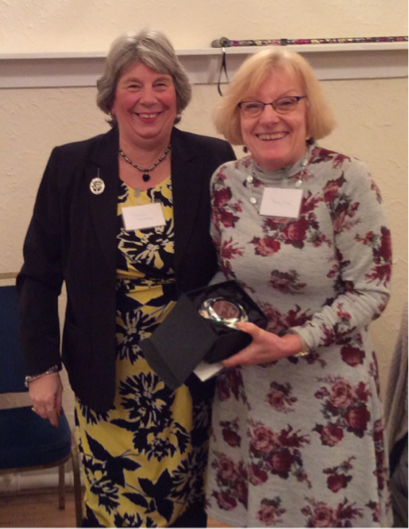 Here our President, Ann Smith, receives the prize. 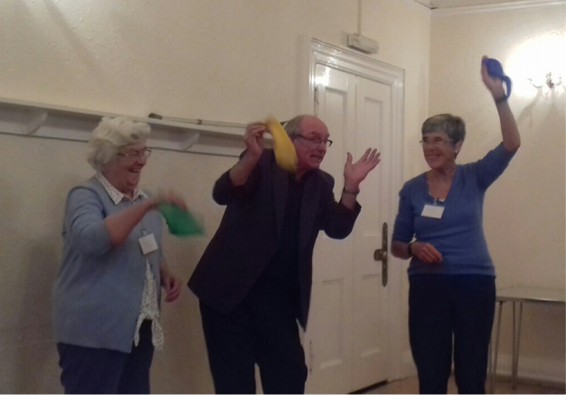 We had a very enjoyable evening with entertainer Ray Lewis. Our Volunteers, Barbara Storey and Virginia Waterfield were confused as to where the hankies went. He told us of his interesting second job as a film extra and children's entertainer for the last forty years. he started off like me in NW London and remembers venues such as the State Cinema in Kilburn where I also went to see shows but he has been much busier than me in the meantime. 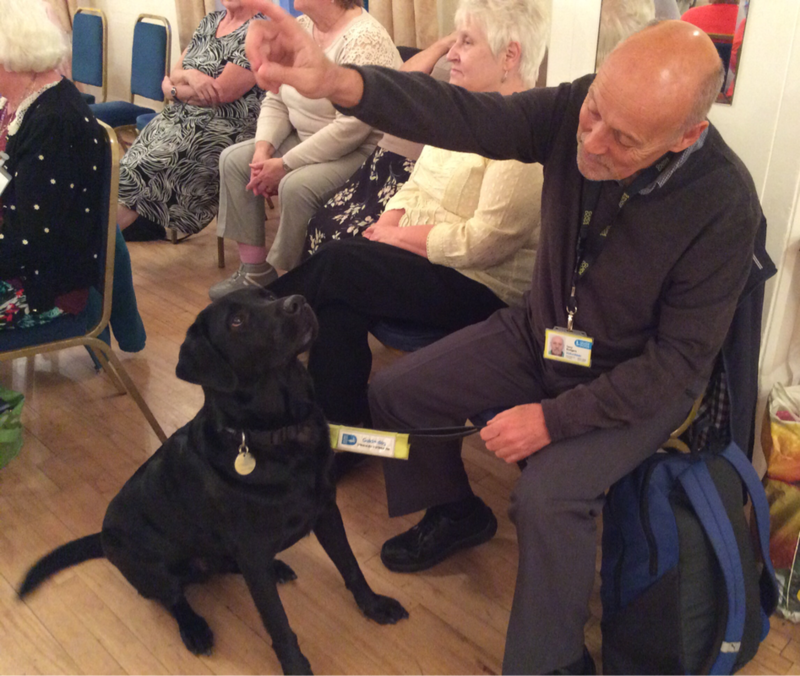 Terry Rodgers brought his Guide Dog to visit us and give us a talk on how Guide Dogs for the Blind are trained and how they enhance life for the visually impaired. Radcliffe on Trent WI ladies never stop. 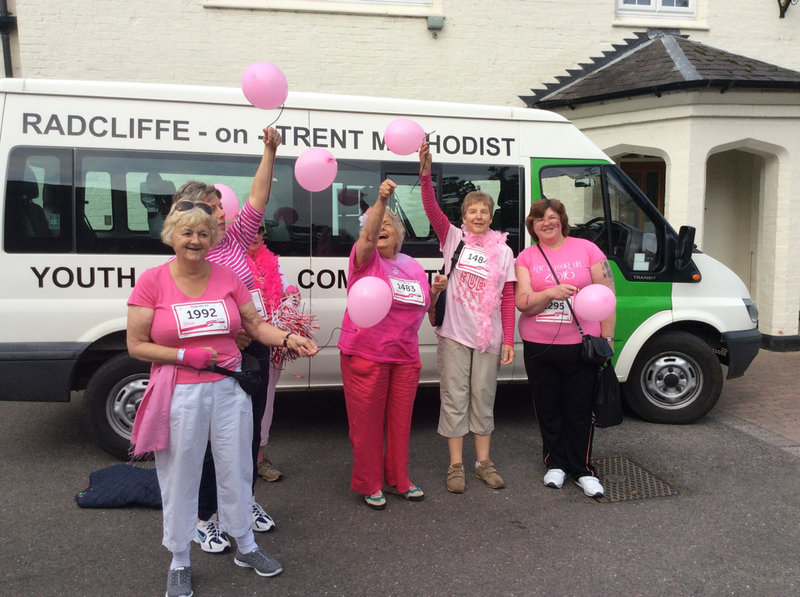 On Sunday morning, 5th June 6 of our members were up bright and early to be taken to Trent Bridge to run The Race for Life. two tutors today. 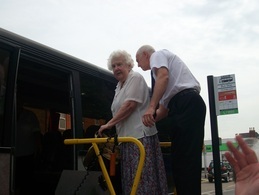 the day was funded by a legacy from Mavis Guttridge who died last year. Mavis would have been happy to see the members practising their craft skills and enjoying a productive day together. 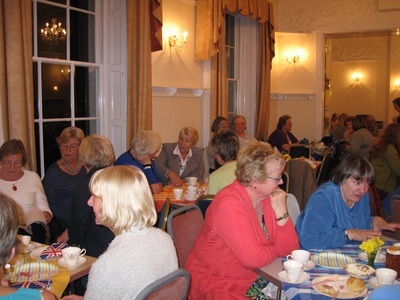 THe Committee prepared refreshments, from coffee and biscuits on arrival to an excellent buffet lunch, finishing with tea and cakes at the end of the day. Further pics.are in the Gallery..
Linda Davy came to our WI to help us through the procedures of the resolutions to be proposed at The Annual Meeting. Our representative will be asked to vote in favour of one resolution and against the other, both with discretion. This meeting also gave us all a chance to discuss our own craft day, see above. Also, we agreed to take part in Notts Fed's attempt to raise funds by giving WIs a £10.00 start to help with fund raising. There were offers to host a Coffee Morning on Tuesday, 7th June at Sheila Eastwood's, a cream tea at Gerry Mill's on Tuesday, 5th July at 2.30 and 3pm and Virginia Waterfield has offered to open her garden on Thursday, 18th August. 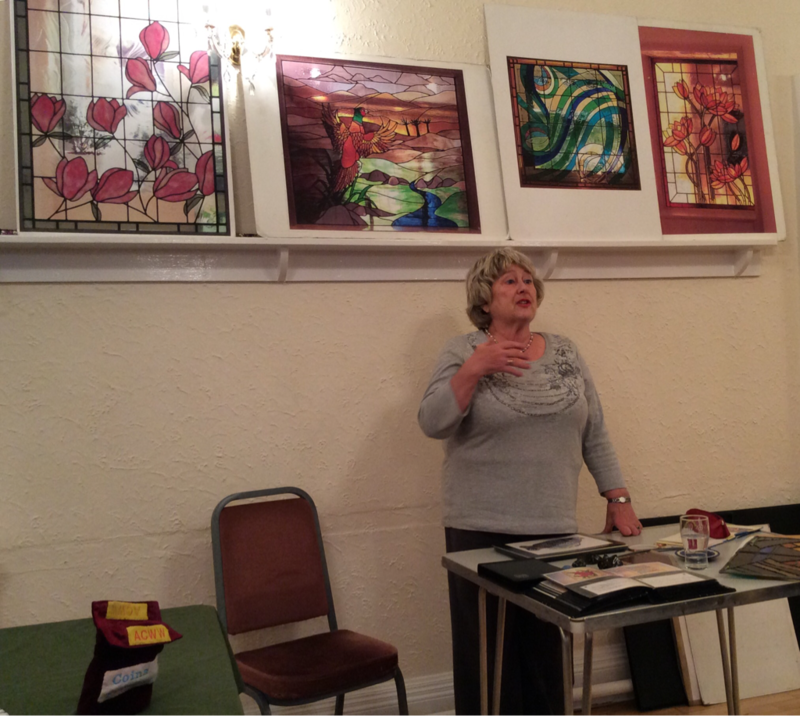 Members enjoyed an entertaining and informative talk from Mrs Rosemary Pike on her experiences making stained glass on commission. She had lots of examples of her work on display and there was also lots of interesting information about Tiffany Glass. This was an important meting for our WI. a new committee was voted in (full details later) and our President, Sandra Thornley, stood down to make way for a new incumbent. After an election by all members present, Ann Smith, previously Secretary, was voted in as President. Gerry Mills, your website manager, demonstrated Radcliffe on Trent's design for Federations Inspirational Women Event at Newstead Abbey last year. the subject, arranged by Gerry and Judy Wilson was E. Nesbit and featured a design representing The Railway Children and The Fabian Society. 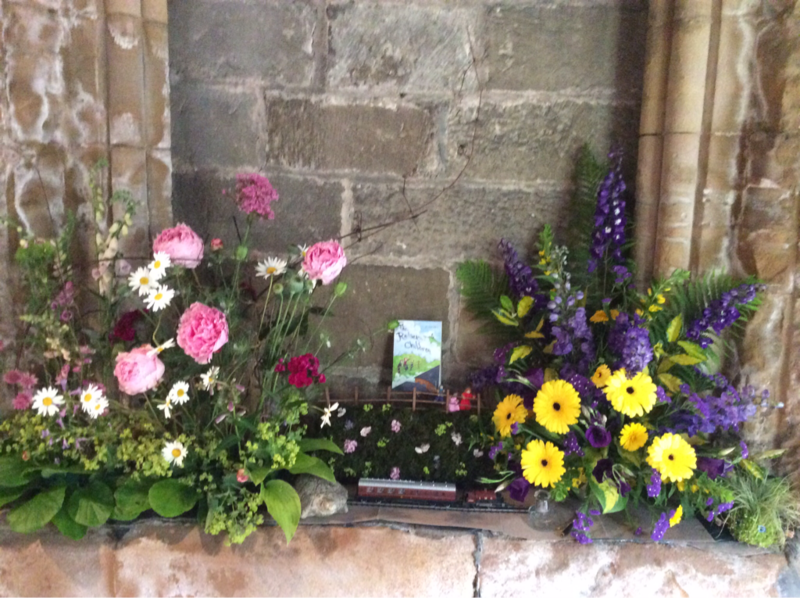 Plus an example of Welcome Flowers. 7 February 2016. 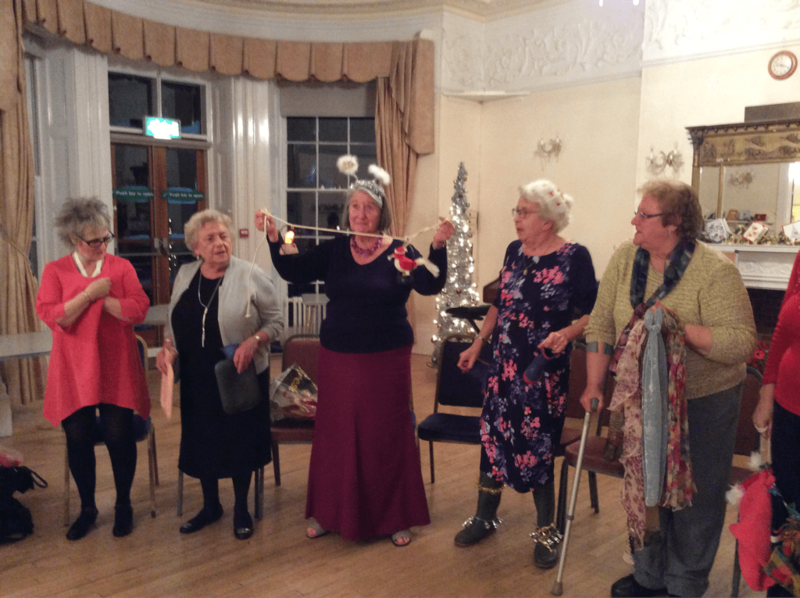 We hope you all had a lovely New Year's Eve and now look forward to a another great year with Radcliffe on Trent WI. We have a wonderful selection of speakers and activities planned for the coming year. Check out the details on our programme page. Don't forget to bring along your subs of £37.50 to our January meeting - cash or cheque made out to Radcliffe on Trent WI. See you all there. The panto this year was Snow White and the Seven Eejits - a twist on the traditional theme - and possibly one of our best to date. You can see photos of the night in the 2015 photo gallery. Radcliffe on Trent WI members and visitors celebrate the Centenary with a cream Tea. 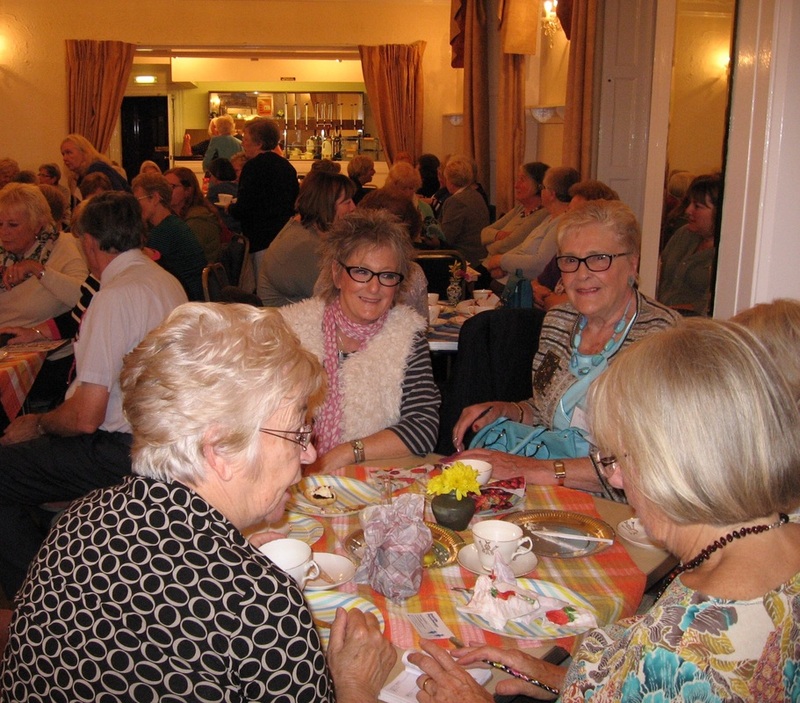 Invited guests from Shelford, Cotgrave, Bingham Belles, Bingham WI, Radcliffe on Trent WIs, Radciffe Ladies' Choir, Ladies from Radcliffe enjoyed a cream tea and a talk by Mr John Whitfield on the topic "Women and their lives in 1915". We were joined at our 95th birthday meeting by Jane Jefferson - county Chairman. You can see her admiring our cake display and looking forward to all the evening had to offer in the photos below. Wow! 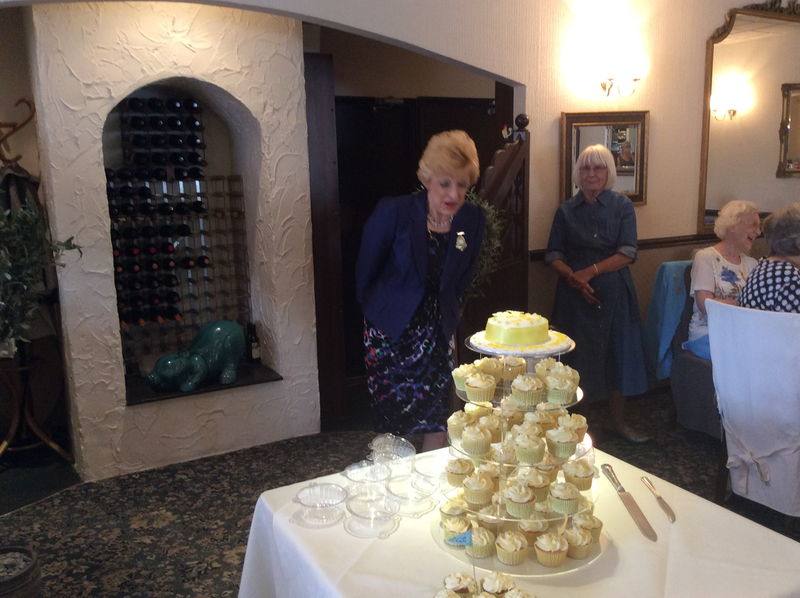 Jane Jefferson County Chairman admires the cakes. 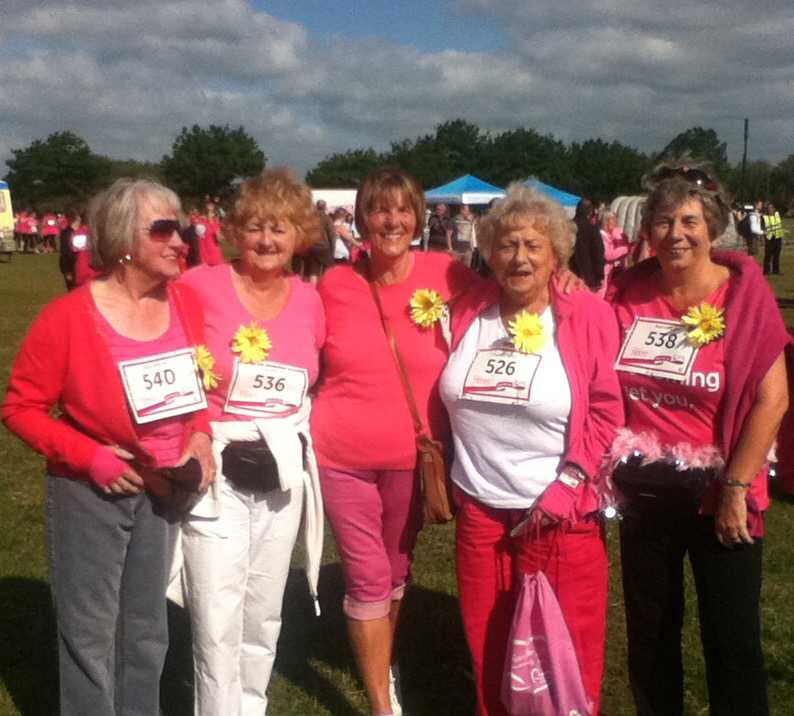 Pat Fowell, Julie Francis, Susan Phillips, Marie Langdon and Sandra Thornley all ran for Charity in the Race for Life to raise funds for Breast Cancer. 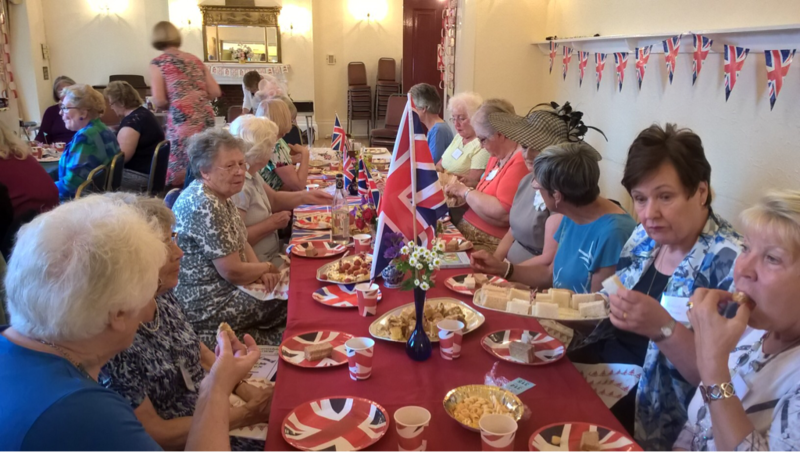 Radcliffe on Trent WI found themselves hard at work providing refreshments at the Annual Carnival. 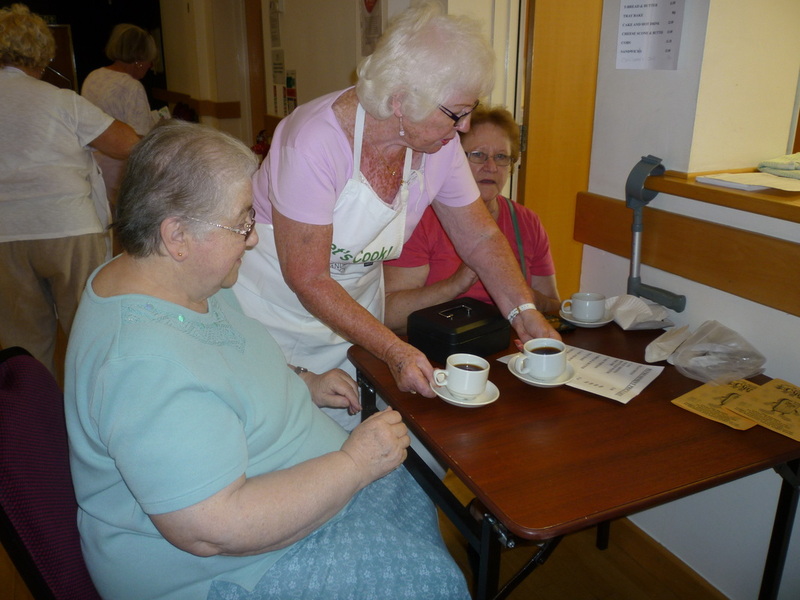 We raise funds for the village community and people queue for or home-made cakes every year. Check out the photos in the gallery. Our exhibit was Gerry Mills and Judy Wilson's interpretation of E. Nesbit, showing The Railway Children, Five Children and It, and the colours of the Fabian Society, of which she was a founder member. Radcliffe on Trent WI are the hostesses for The Cliff Group get together twice annual meetings this year. We shall be holding the first meeting on Tuesday 28th April, 7 for 7-30 in the Radcliffe on Trent Royal British Legion. The evening will consist of a bread making demonstration, using that theme for the refreshments to include various flavoured breads with assorted cheeses, chutneys, plus sweet and savoury scones with butter, jam and cream, along with tea and coffee. Cost for this including a raffle is just £4.99. The competition will be a Spring posy in a teacup. Tickets will be available at our February meeting. We have a walk and lunch to look forward to on Wednesday, 11th February, blow away those winter cobwebs. Please meet at The Royal British Legion car park at 10-45am, to arrange lifts, then it's on to the Water Sports Centre at Holme Pierrepont for a healthy walk as far or as short as you wish. This will be followed with lunch at the Gamston Lock public house/restaurant 12.15. Please join us. Nine of us enjoyed our walk at Holme Pierrepont on Wednesday, with another couple of ladies who joined us for lunch. We weather was dry and crisp which was an added bonus. Find out more about the walking group HERE. 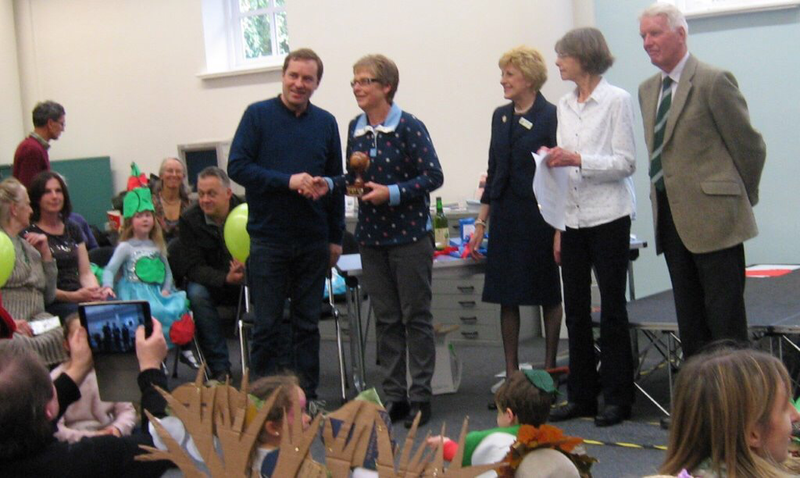 We took part in the 2014 Village Show by organising a bake-off contest. The cups for the Best in Show in each class were donated by village members, mostly as Memorial Cups. Our judges take this very seriously and they had a tough job. There were entries for apple pies, Victoria sponges, jams and chutneys, Didn't they all do well - I have to admit, I came second in the apple pie competition although my jam didn't make the grade this year. Roll on 2015! 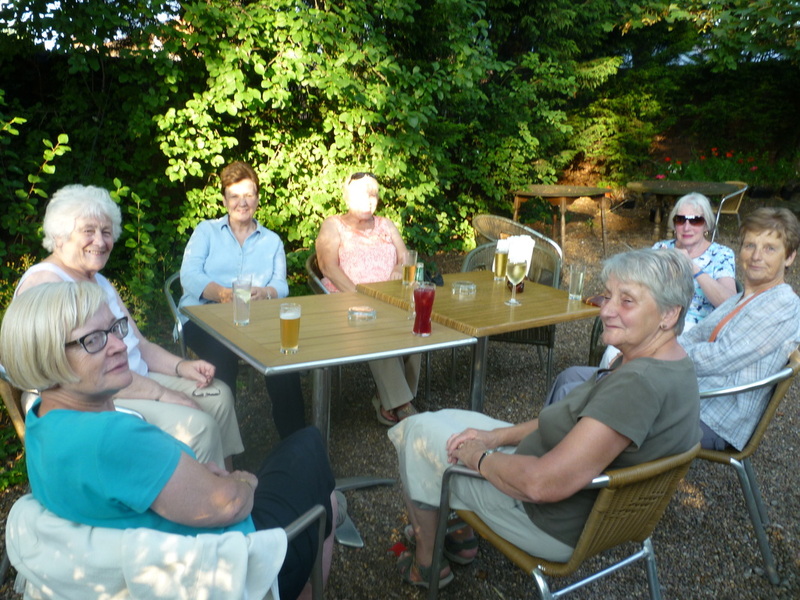 Radcliffe on Trent WI are meeting at The Manvers Pub, Radcliffe for lunch at 12-30pm on ???? - be warned if you are not a member you will probably be caught up in a lot of noise and jollity. Radcliffe on Trent WI summer walk took place on Tuesday 21 July. The weather was wonderful and the walk was enjoyed by those who came along. As you will see from the photo below some walkers took time out for a little fun along the way. 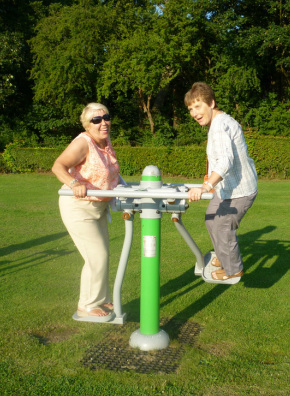 Linda and Ann recapturing their youth at the playground. A group of Radcliffe on Trent ladies, Marie Langdon, Gerry Mills, Susan Sedgeley and Virginia Waterfield joined a Notts Fed educational visit to the Veolia Recycling Centre in the wastes of a Mansfield industrial estate. Some of us are bitter because we got lost on the way. It was good to see that our efforts to sort out our rubbish are not wasted and that all our rubbish is sorted into bales and sent off to be re-used. Apparently, newspapers can be recycled and re-appear the next week, good as the real thing. We were even shown how to recycle our old duvet covers into place mats and bath rugs - as illustrated below with Susan Sedgely having a lesson in toothbrush rag-rug making from Jackie! 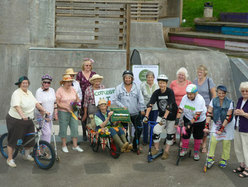 This is our official picture of the Radcliffe on Trent WI Baton Exchange which took place today at our local skate park between Cotgrave WI and us. Read a little more about it below. Please join us in welcoming the WI baton to our village, Radcliffe on Trent, on Friday 13th June, 4.30pm on the Skate Park. Come dressed in sporty gear, helmets, knee pads, skateboards, bikes or scooters (not disabled!). 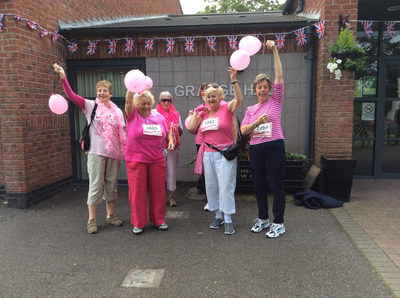 We want to welcome the WI baton to Radcliffe on Trent looking like active ladies. It should make for some interesting photos. If you take any good shots on the day just send them to us using the envelope icon at the top of this page or to Gerry Mills on:- Michael.mills27@ntlworld.com. The baton will travel around the country before reaching the Royal Albert Hall, London on 4 June 2015 to join in the celebrations of 100 years of the WI in Britain. Come and join us, it will be fun. A group of RoT WI ladies went to see Sister Act this week. What a fabulous show. We all loved it and joined in the standing ovation at the end. Thank you to Maureen Barbour for organising the outing for us. It is with much sadness that we must report the death of our oldest member, Miss Mavis Guttridge, age 93. She passed away on 26th May after suffering for many years with ill health, but she was a true WI member, still taking an active role in the WI and other organisations that she was interested in right up till the end. Mavis joined Radcliffe on Trent WI back in 1971, joining the committee in 1974, then taking on the role of Treasurer from 1975 to 1978, when she then became the President until 1981. 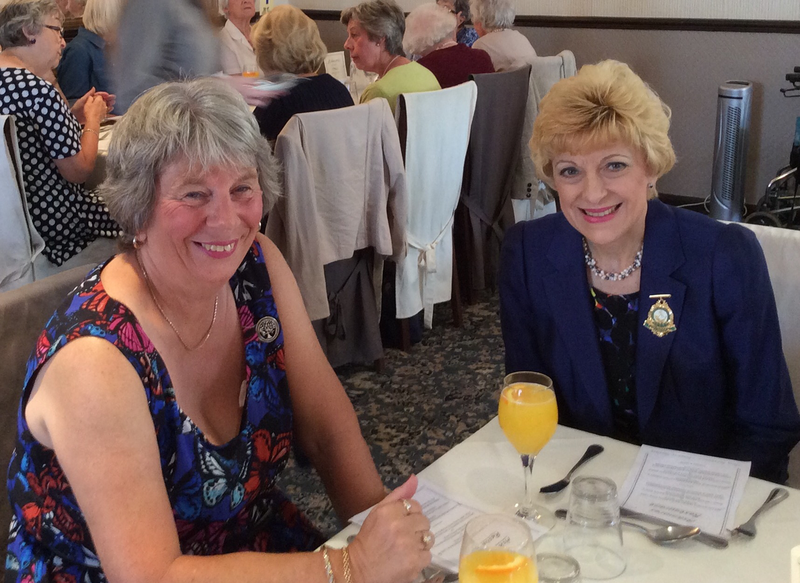 In 1988 to 1990 she took over the Secretary's Role, these were the official roles she had, but she was always an active member within our WI, representing Radcliffe at AGMs and other meetings and forums. 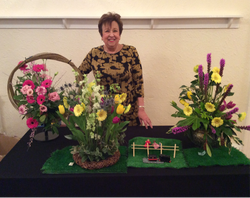 This year the craft competition at Newark Show was "Inspiring Music". 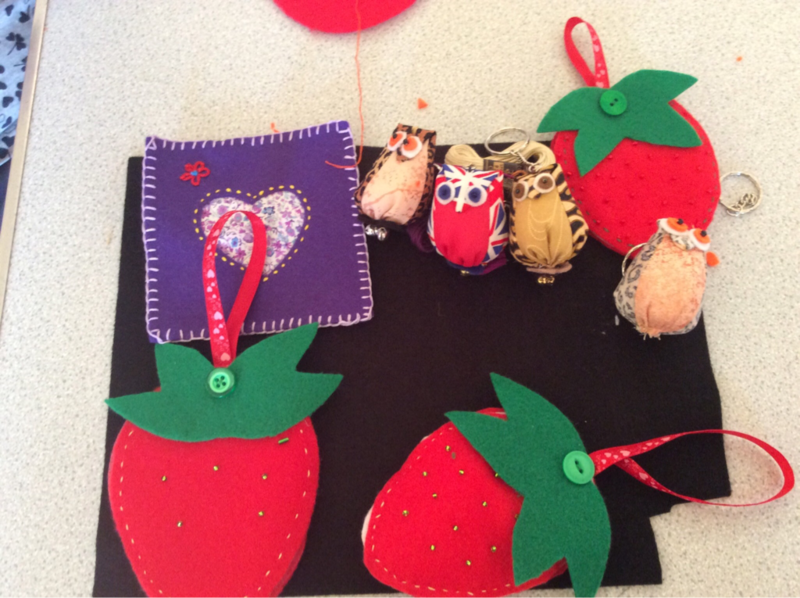 Design a CD cover and two craft items to illustrate a piece of inspiring music. 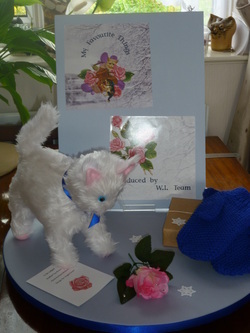 RoT WI chose "My Favourite Things" as our inspiration and our exhibit showed just a few of the items mentioned in the song - namely a kitten, a raindrop -covered rose and some warm woollen mittens. Although we didn't win er had a great time making the display and were proud to exhibit at the show alongside some great entries from other WIs in the county. See the other entries in the gallery. 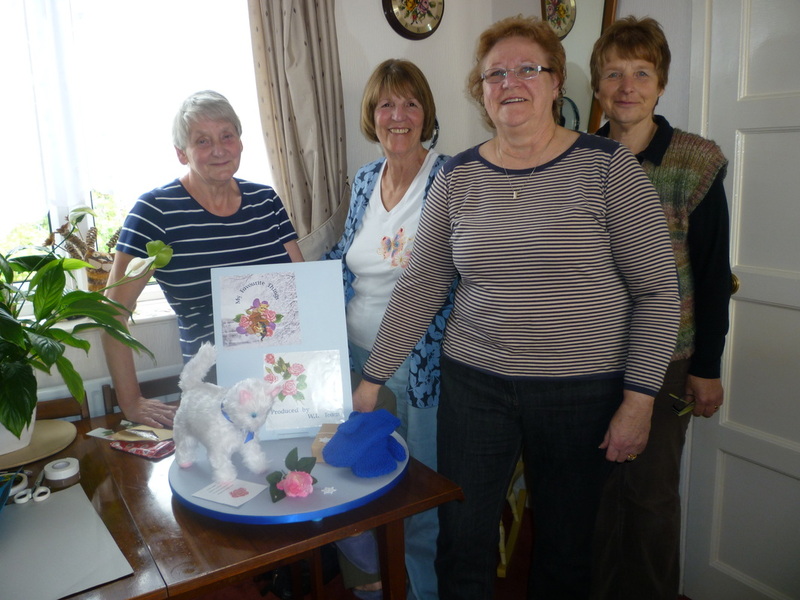 Radcliffe on Trent WI members, Judy Wilson, Sue Phillips, Sylvia Annetts and Ann Smith's creative talents made our entry for the Notts County Agricultural Show. Our next meeting will be on the 20 May when we will be debating the 2014 Resolution. Every year the WI chooses one or more topics to discuss and a vote is taken on which ones the WI will add its campaigning voice behind. 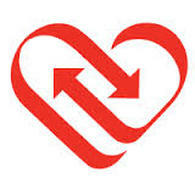 The topic for discussion this year is whether the WI should be trying to encourage people to have a difficult discussion with their friends and family about their thoughts on organ donation. Having had that talk means that should the worst thing happen and they are approached by the transplant team they would know exactly what you wanted to happen. Linda Davey came to explain the thinking behind this Resolution. Unlike most WI resolutions, this does not involve lobbying the government to change the law or provide money. We were asked to make our families and friends aware of the Organ Donation Scheme if die in circumstances which would make this possible. It made for a thought provoking meeting. It is a very difficult subject to bring up with families. It is no good putting this off until it is too late. Families need to know your wishes in advance. Have that conversation now. The resolution was passed with the proviso that our delegate would have a discretionary vote. 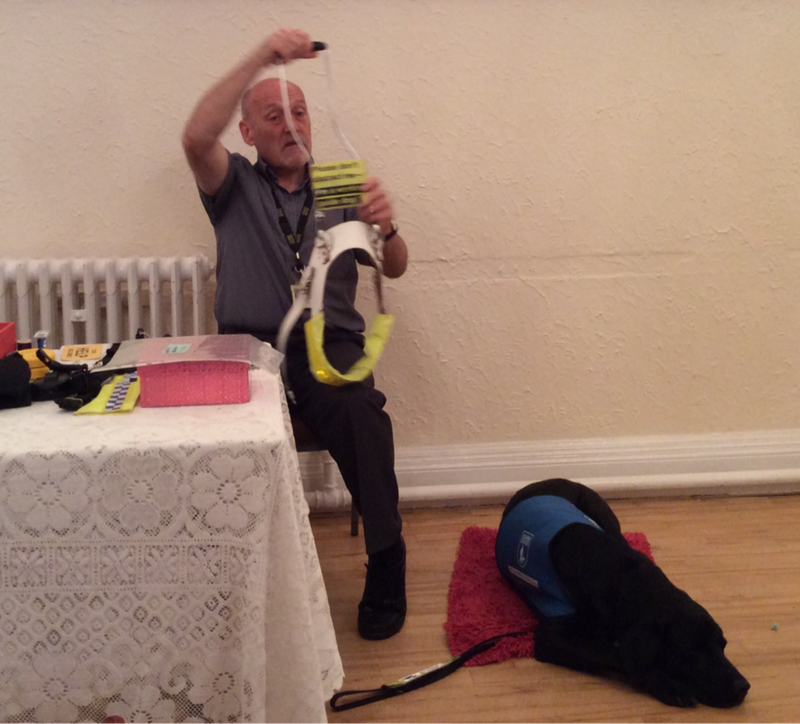 Notts Federation held a Website Building day at County House. 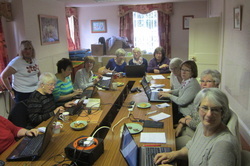 Ten nervous WI members brought their laptops and learnt how to upload our photos and WI news so that we can spread the word on how brilliant our WIs really are. After a few hours we were adding links to other web sites, posting details of our WI meetings and illustrating our news with photos like this one which shows the class in action on the day.